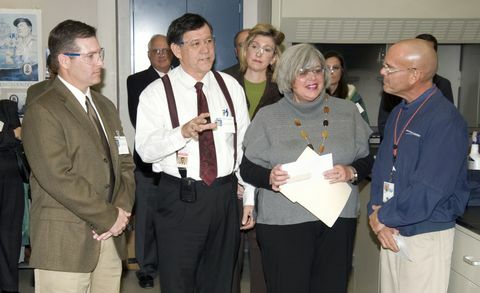 PASCAGOULA, Miss., Jan. 19, 2010 -- Northrop Grumman Corporation’s (NYSE:NOC) Shipbuilding sector has awarded $82,000 in grants to Gulf Coast school districts in Louisiana, Mississippi and Alabama to use for science, technology, engineering and math (STEM) projects. Each district selected one middle school to receive the grant enabling them to implement and improve necessary STEM resources. Representatives from schools and school districts across the Gulf Coast attended a short ceremony in the company’s chemistry lab where they were awarded their grant checks, and provided details describing their STEM projects. Visit http://www.northropgrumman.com/corporate-responsibility/corporate-citizenship/contribution-guidelines.html for information about participating in the STEM grant program, the company’s contributions guidelines, and an online application. Only one middle school STEM program will be selected for each school district. Grant applications must be submitted by Aug. 31, 2010. Applications submitted earliest will be considered first.